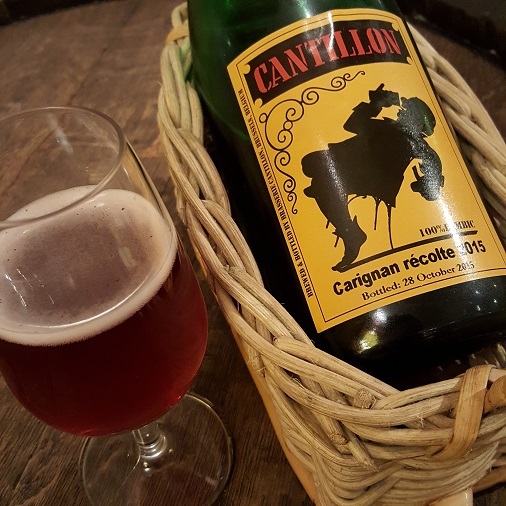 Brewer Description: 200kg of Carignan grapes in a 400 litre barrel with 2 year lambic. Intro: A 750ml bottle at the brewery. 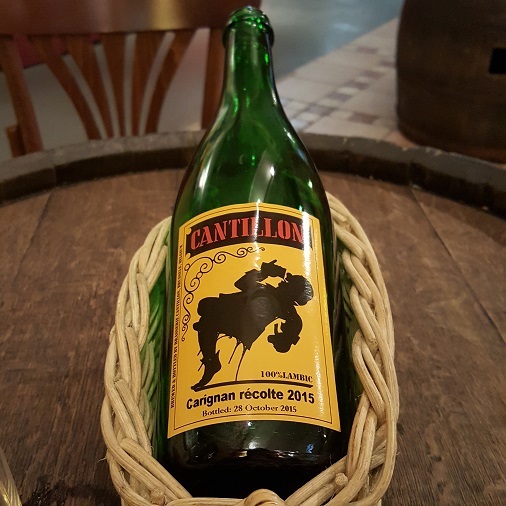 2015 version bottled on 28th October 2015. 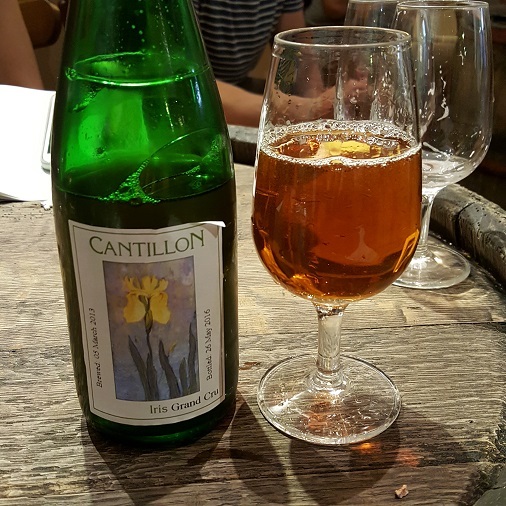 Poured into a Cantillon tasting glass. Appearance: It poured a slightly hazy purple-ish, grape red colour with a one finger pinkish head that settles to a thin layer with moderate lacing. Aroma: Sour, tart, fruity, grape, cherry and strawberry. Taste: Quite similar to the aroma with sour, tart, grape, cherry, strawberry, cranberry, raspberry and light funkiness. Mouthfeel: Light creaminess, light bodied with moderate carbonation. Overall: This was excellent. It looks great, tastes great and was refreshing. Brewer Description: Lambic with rhubarb added. Note: I do not know what rhubarb smells or tastes like. Intro: As Zwanze 2012 version. A 750ml bottle at the brewery. Poured into a Cantillon tasting glass. Appearance: It poured a hazy golden orange colour with a half finger white head that dissipated fairly quickly and left almost no lacing. Aroma: Tart, funky and oak with a touch of leather and some fruitiness (which I will assume is rhubarb). 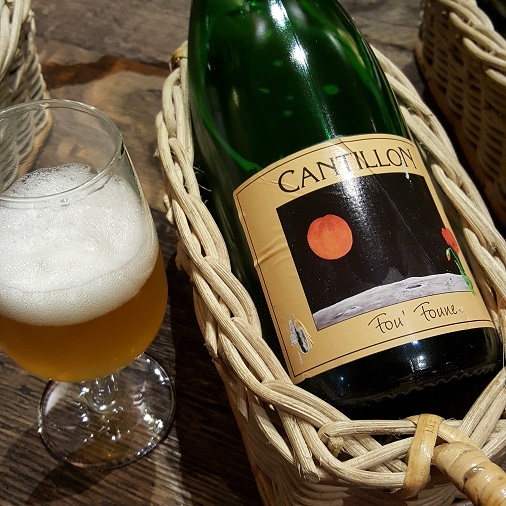 Taste: Sour, tart and funky. Some hay, lemon, grapefruit and a tart fruitiness (which again I will assume is rhubarb). Mouthfeel: Dry-ish, light bodied with low to moderate carbonation. 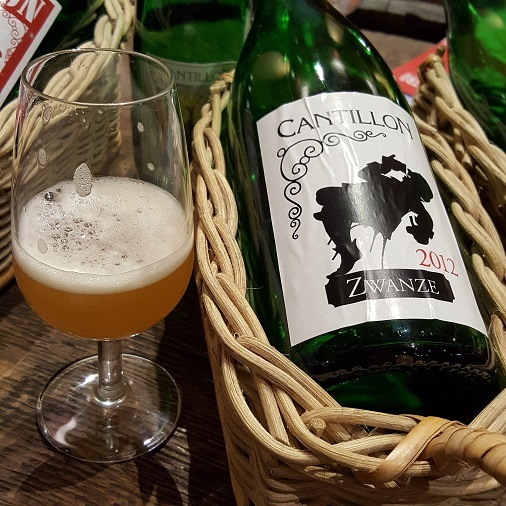 Overall: Another nice beer from Cantillon and my first Zwanze. I do kind of wish I tried actual rhubarb first before trying this beer so that I had at least an idea of how close or how strong the rhubarb came through. But in any case, this was still very good. Brewer Description: Around 300 grams of Bergeron apricots per liter. Intro: A 750ml bottle at the brewery. I believe it was bottled in August 2015. Poured into a Cantillon tasting glass. Appearance: It poured a hazy golden orange colour with a two finger white head with pretty good retention and left sparse lacing. Aroma: Funky, sour, apricot, stone fruit and citrusy lemon. Taste: Sour, tart, apricot, mango, orange, barnyard, hay with a hint of vinegar. Mouthfeel: Crisp, light bodied with moderate spritzy carbonation. Overall: Wow, really good. Easily a must buy in my book and I’m definitely on the lookout for it. Intro: A 750ml bottle at the brewery. I didn’t see a bottled on date but as this bottle had the newly printed red label, it was probably early 2016. Poured into a Cantillon tasting glass. Appearance: It poured a clear strawberry red with a two finger white head that dissipated almost immediately and left sparse lacing. Aroma: Light funk with fruity strawberry, cherry, grape and light oak plus floweriness. Taste: The floweriness really comes out in the taste followed by grape, strawberry and raspberry fruit with bits of hay. Overall: Very nice sour with fruit. Not a big fan of the floweriness, but this was ok and not overpowering. Very easy and refreshing to drink. Brewer Description: Similar to Iris, but bottled before the dry hopping process and aged in the barrel for an additional year for a total of three years. 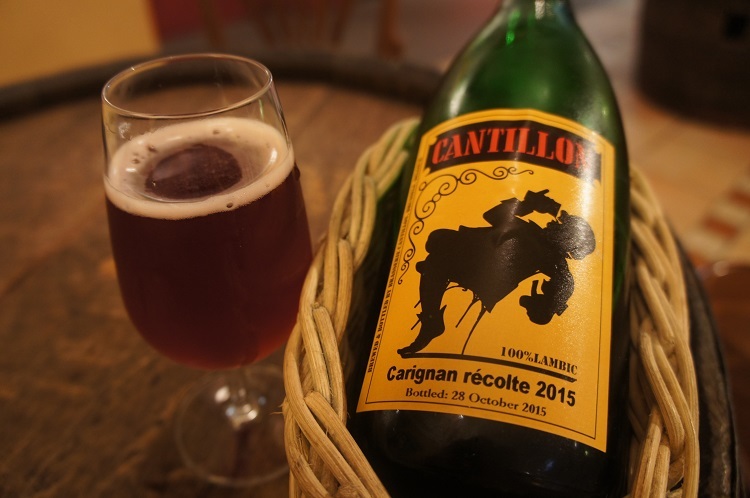 Intro: A 375ml bottle at the brewery, brewed on 5th March 2013, bottled on 26th May 2016 and poured into a Cantillon tasting glass. Appearance: It poured a clear copper orange colour with pretty much no head and sparse lacing. Aroma: Funky, sour, grapefruit, lemon, leather and oak. Taste: Funky, barnyard, sour, caramel, bitter melon bitterness, grapefruit, lemon and oak. Mouthfeel: Light to medium bodied with no carbonation. 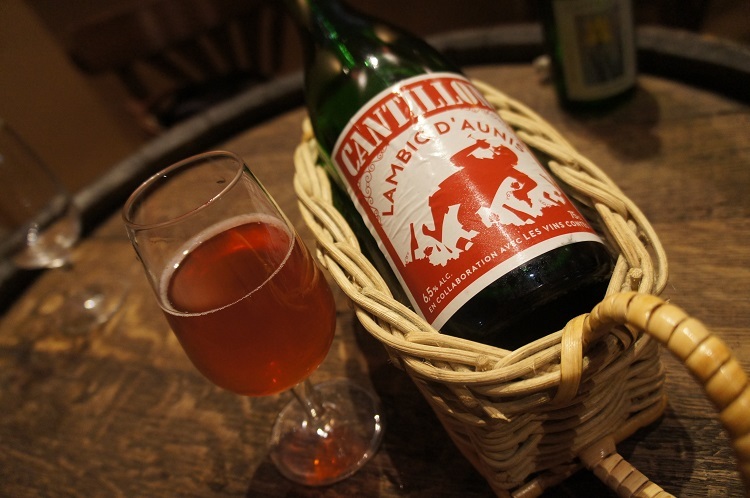 Overall: This was nice and easy to drink and I preferred it over the Bruocsella Grand Cru. I’ve yet to try Iris though, so can’t compare it to that yet.